Today I will restrict my writing to one garment, the Kyptar, also spelled Keptar. This is the sheepskin vest which is so distinctive to the Hutsul costume. 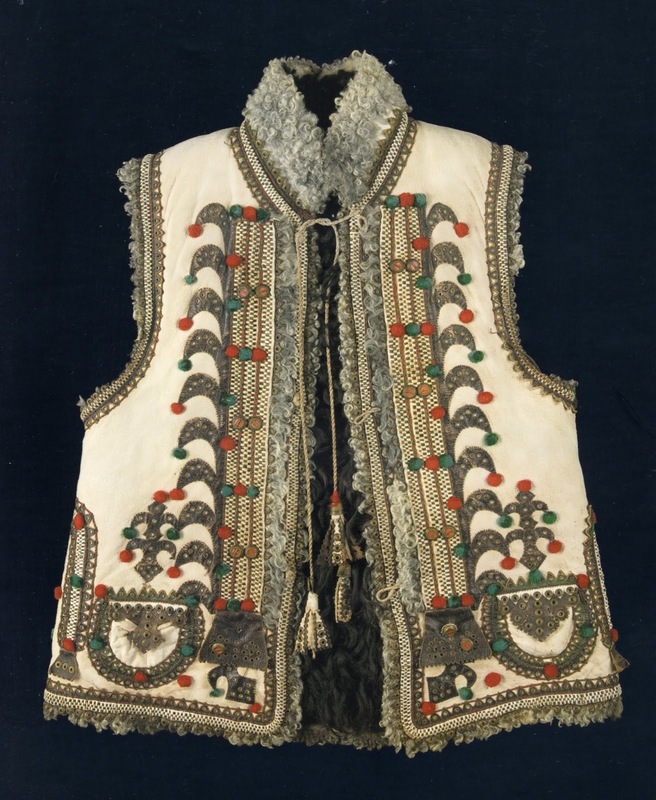 The sheepskin vest itself is of course worn throughout the Carpathian region and beyond, by Polish, Slovaks, Hungarians, Romanians, Croatians, Bulgarians, and also in other parts of Ukraine, and some of them are very richly decorated, but the Hutsul Kyptar is obvious at a glance. The cut is very simple, the sides being straight or slightly expanding towards the bottom. Unusually, neither the cut nor the ornamentation varies by gender. The only difference between a man's Kyptar and a woman's is the size, You can see in the two photos above, that they are equally elaborate. 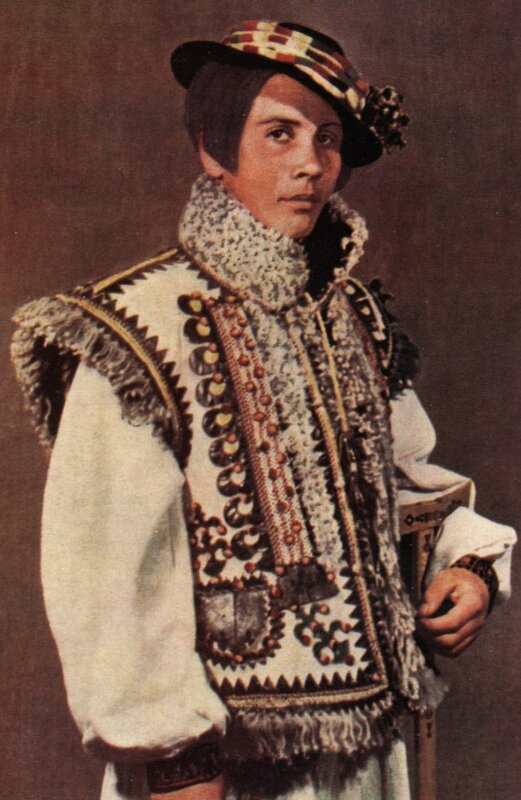 The fleece is always worn on the inside, unlike some places in Western Europe, where they wear the fleece on the outside. 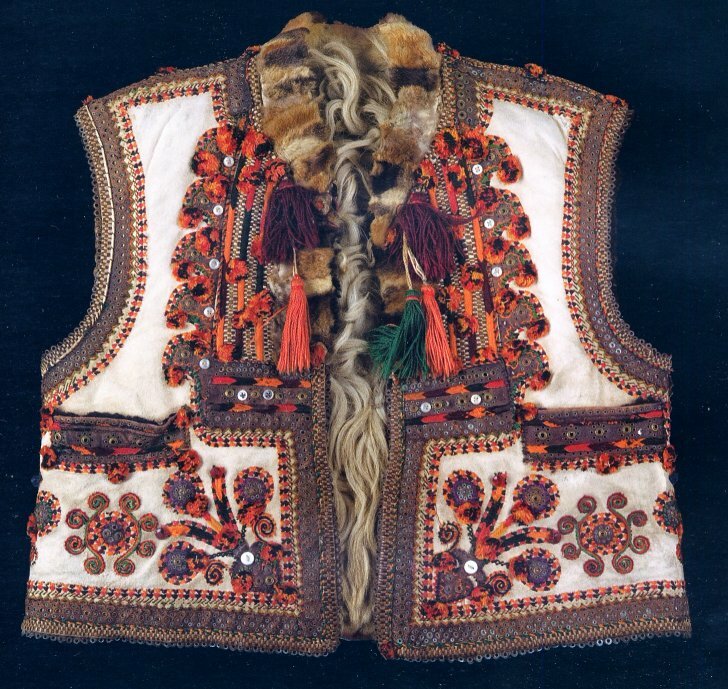 The Hutsul Kyptar is decorated primarily with applique, but also with braid, buttons, embroidery, tassels, pompoms and strips of lambskin or fur. This type of work, by the way, was traditionally done by men, who specialized in making them. Women did almost all the embroidery on linen, but men did the work on outer garments which were made of either leather, sheepskin, or a very heavy and stiff woven wool. 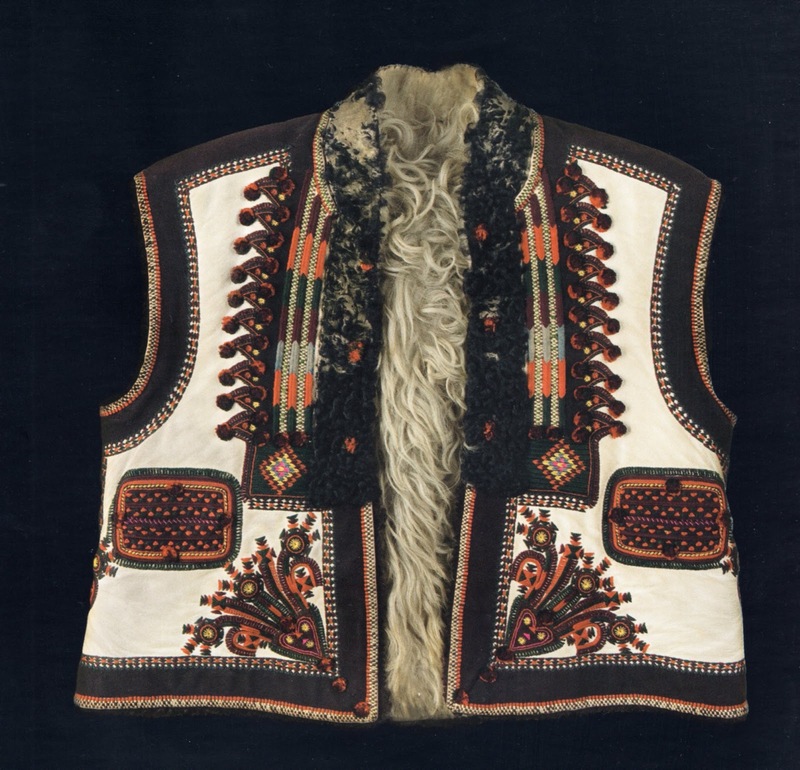 One of the most characteristic element of the Hutsul Kyptar are the teeth, or zubtsi, which are found along the edge of the decorative panel on the front, and often around all the edges, as you can see from the images. 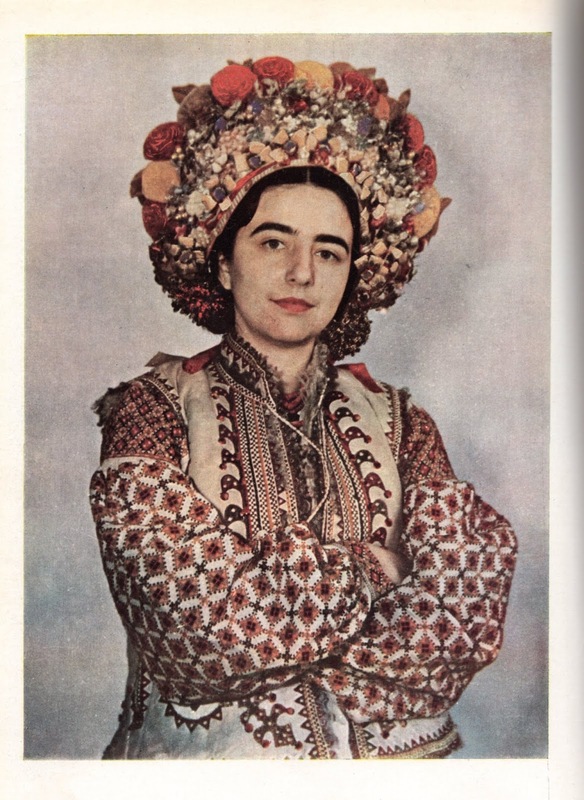 I am going to quickly show and describe six types of Hustul Kyptary, following the categories described by Iryna Karpynets in her book, 'Keptari Ukrajins'kykh Karpat'. This by no means exhausts the subject; there are other types, and of course, much individual difference between individual garments. This, as well as the two above and the images folowing, is a Kyptar of the 'Kosiw' type. 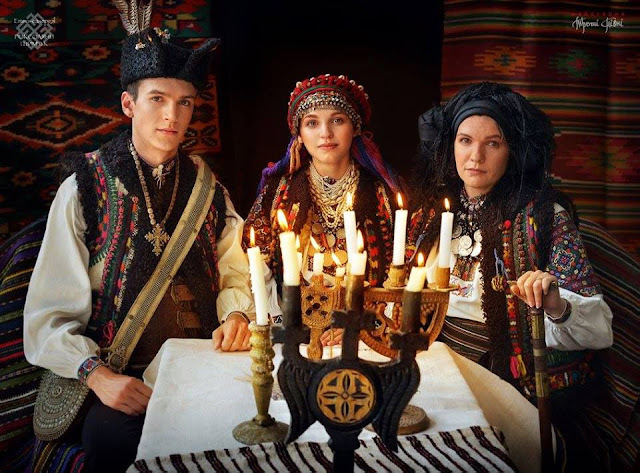 This is found in the northern part of the Hutsul region, from the villages immediately around Kosiw west through Kolomyja district and also around Jaremcha. As in all Kyptary, the seams are always ornamented. 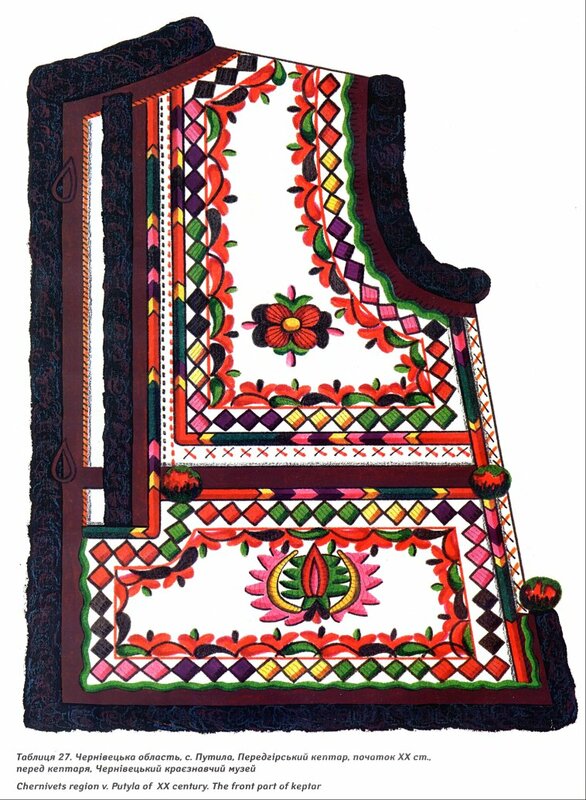 A major feature of kyptar ornamentation is the sylianka. 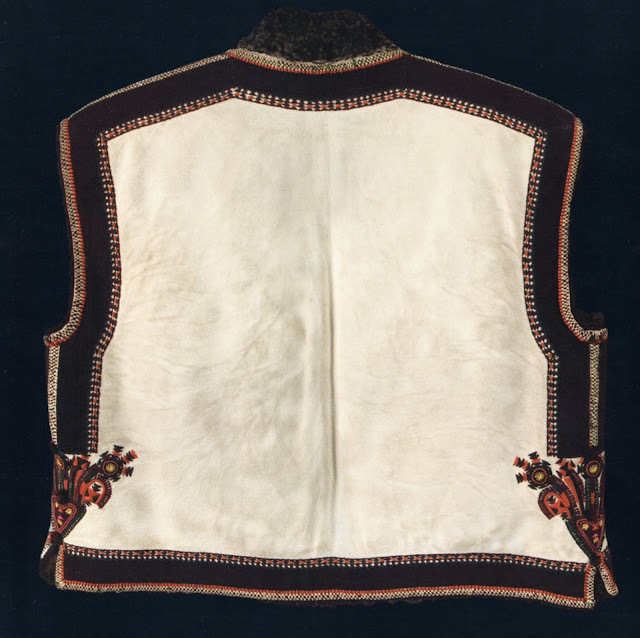 This is a strip of white thin leather with slits cut into it, and through the slits flat laces of dark leather are woven, usually three or four of them side by side, woven alternately so as to form a sort of checkerboard, which is then appliqued onto the kyptar. In this type of kyptar, the sylianky are placed over the seams, all around the edges, a horizontal line on the back, two 'princess' lines also on the back that intersect it, and three rows on the front to make the decorative panel. Teeth of dyed moroccan leather are appliqued around all the edges and the sylianka lines on the back. The teeth emanating from the front panel are curved, either up or down. 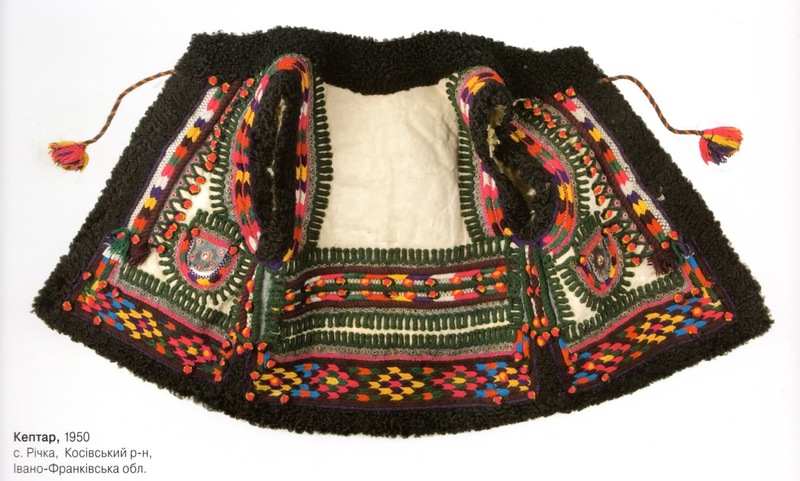 The moroccan leather also forms the 'rachky', 'crayfish' shapes which in this type of kyptar are scattered on the bottom portion. 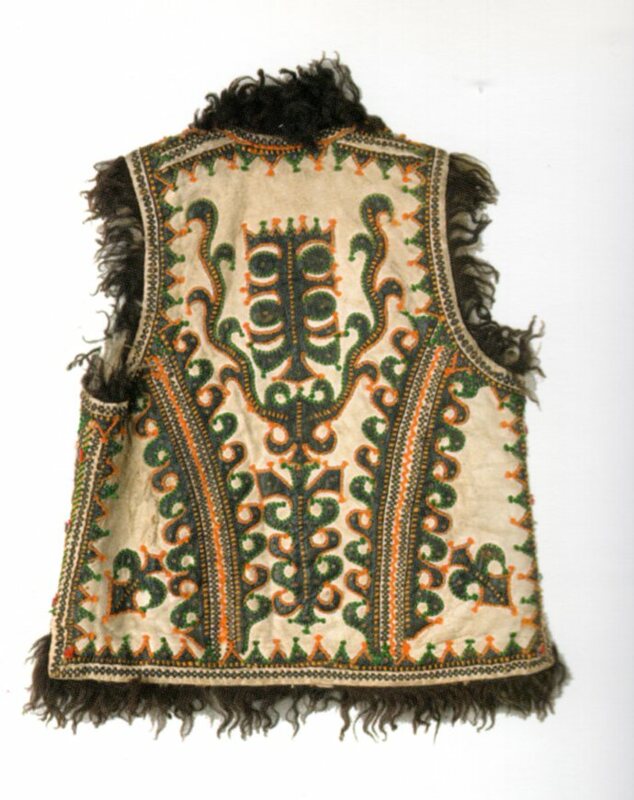 The moroccan leather applique are studded with metal eyelets, and edged with wool cord, usually green and orange, and small pompoms are attached at the tips, and in the middle of the front panel. The edges are trimmed with curly lambs wool strips, which are also placed on the collar. 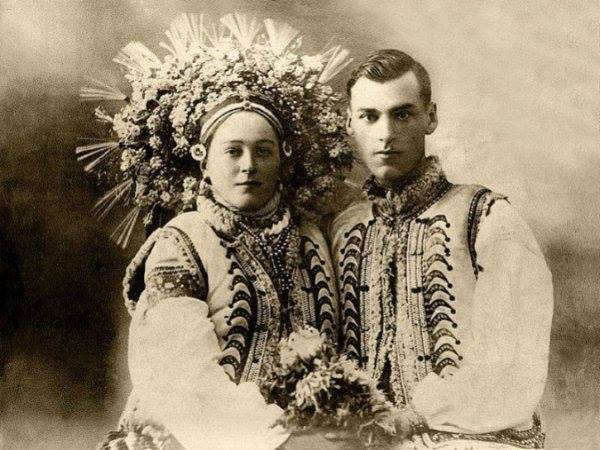 This famous photo of a wedding couple is from the village of Kornych near Kolomyja. This is at the northern edge of the Hutsul region, and some people consider it to be part of Pokuttia. Wedding headresses in this district are exceptionally large. This woman is from the village of Jabluniw northwest of Kosiw. 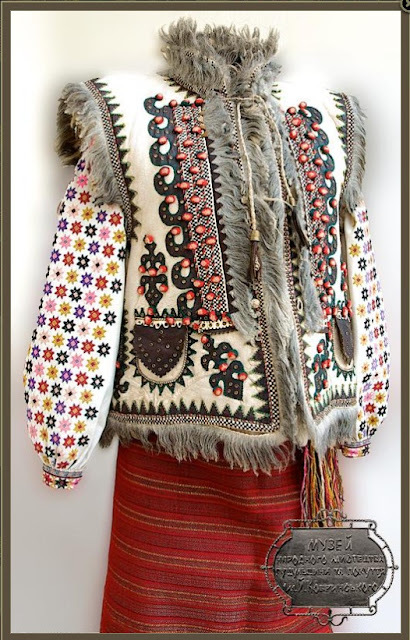 The following garment is from the village of Pistyn' near Kosiw. 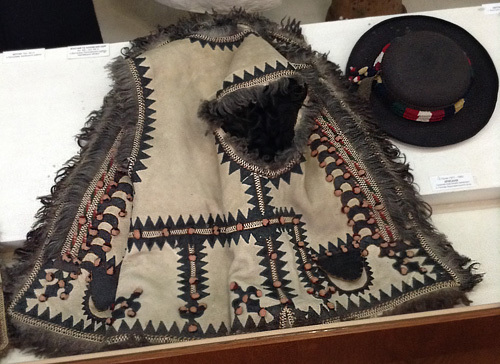 This kyptar is from the village of Sokoliwka near Kosiw. 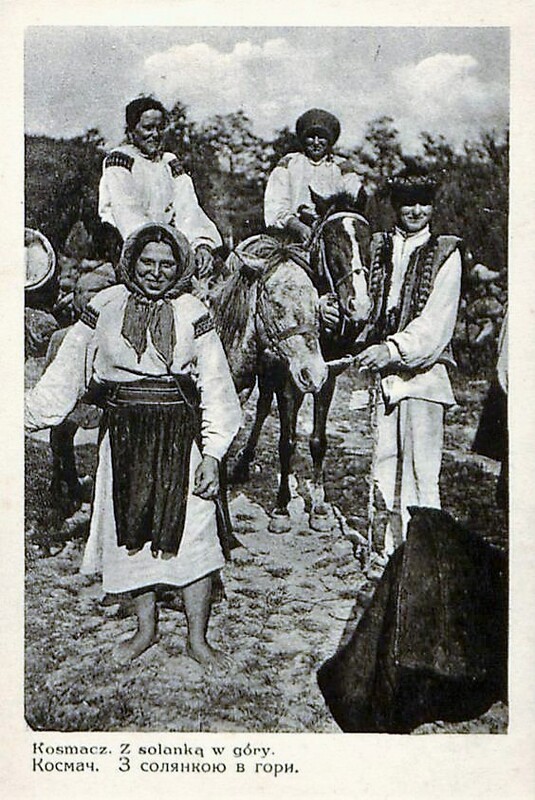 This one is from the village of Zarichchia, further west. 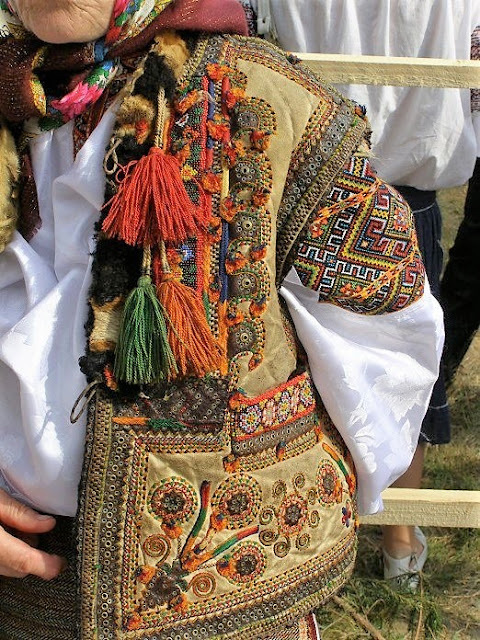 This style is found in the town of Kosmach, and similar styles are found in other villages to the west, like Dora and Mikulychyn. 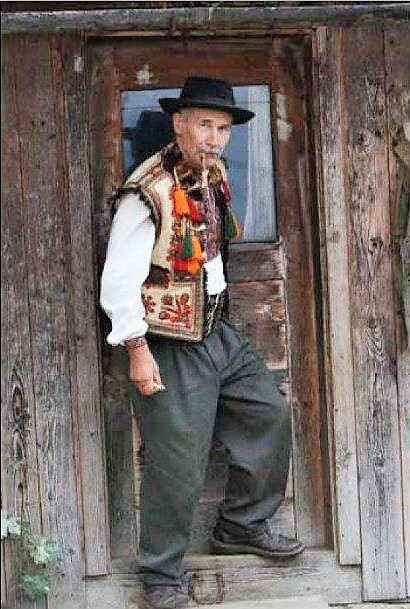 This man is Il'ko Topuziak, a Trembitar [alpenhorn player] from the village of Kosmach. 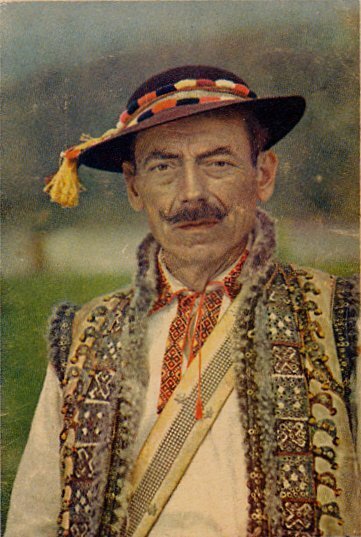 You can see the characteristic Kosmach embroidery on his shirt. This type of kyptar resembles the previous one in many ways, The curved teeth of the front panel are still present. 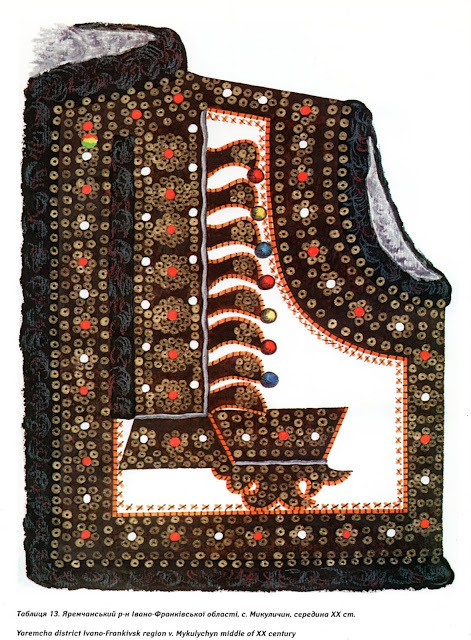 The panel itself is made of several squares of morrocan leather appliqued to the front. 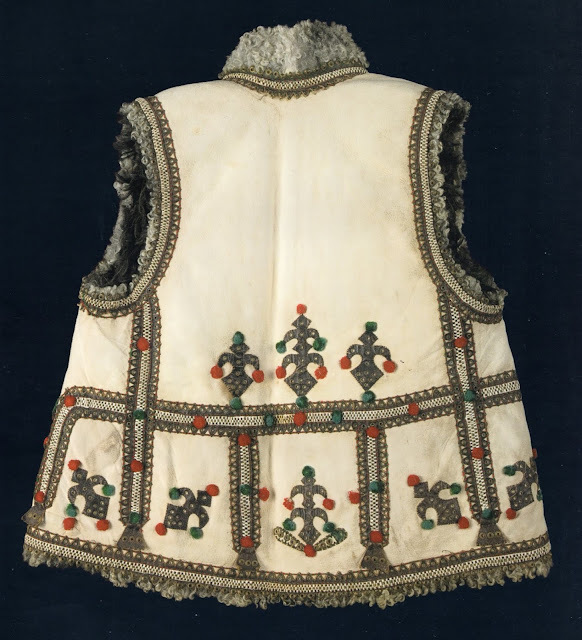 The metal eyelets are used much more profusely on these squares, on the pockets, and also on the strips which are appliqued around the edges. There are still some 'crawdads' appliqued on the lower edge. The strips of curly lambskin are not present around the edges, only on the collar. The sylianky make no appearance. The cording and the pompoms are present. 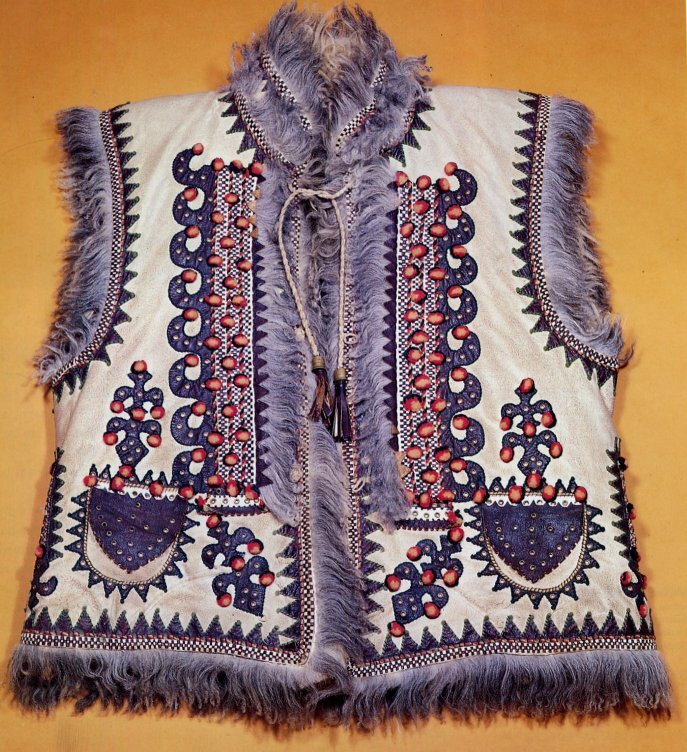 There can be small motifs actually embroidered onto the sheepskin, as in the bottom example. 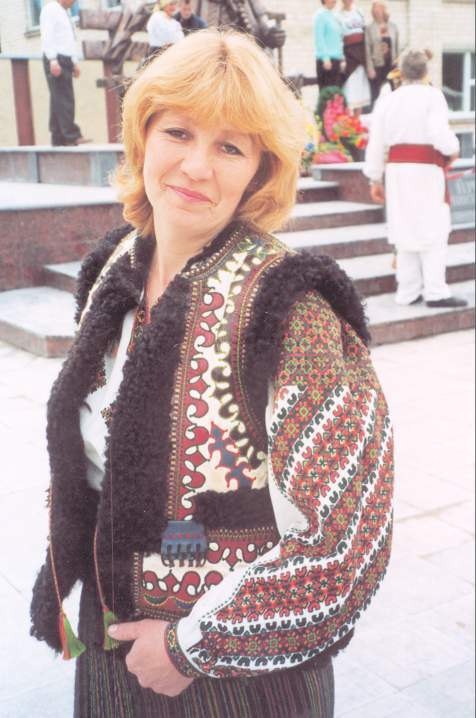 This one seems to be from the village of Mykulychyn, although the embroidery on the chemise is Kosmach. This kyptar is from Mykulychyn. This one is from the village of Dora. 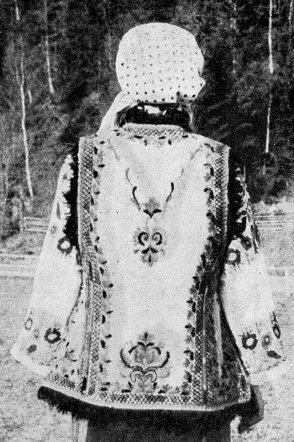 This is found around the town of Verkhovyna, and the central part of the Hutsul Region, in the valley of the Black Cheremosh river. 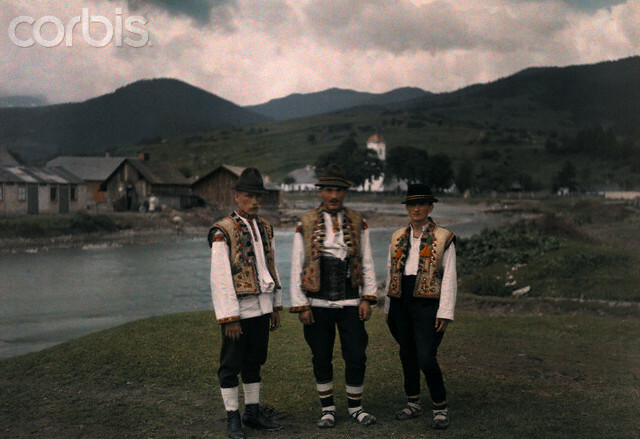 It is found as far north as the villages of Richka and Javoriw south of Kosiw, and as far west as Vorokhta. The photos below show this type. 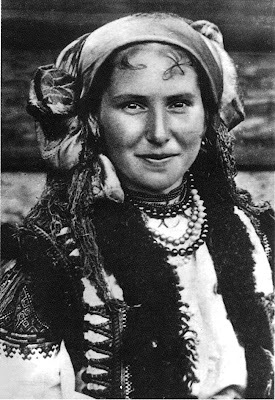 The first photograph is of a Hutsul woman taken in the 1930's. 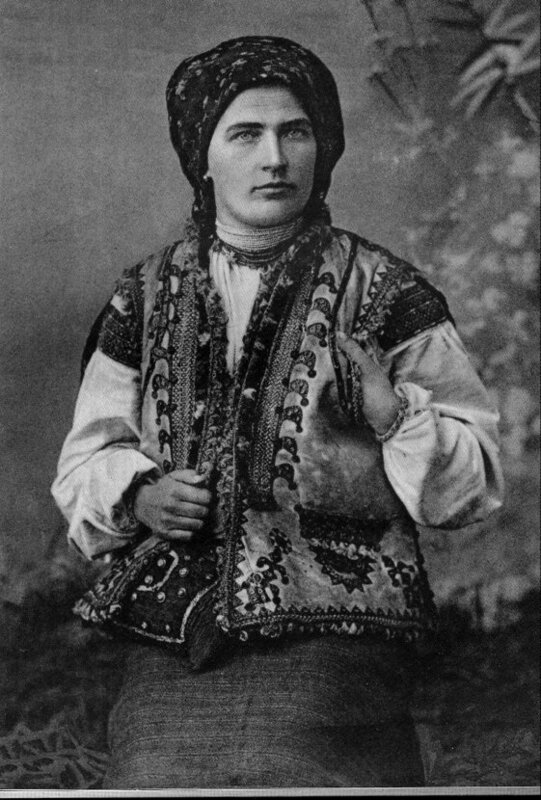 She is wearing a very large kerchief wrapped in the traditional Hutsul manner, passed behind the neck, then over the head an tucked in over the ears to make a characteristic puff on the sides of the head. 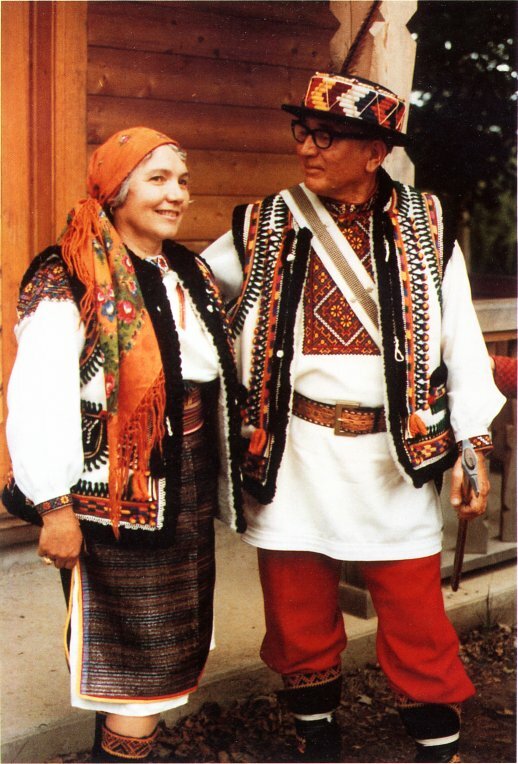 The next picture shows Evdokia Sorokhaniuk, the famous Hutsul Embroiderer, with her husband, the photo taken in 1981. 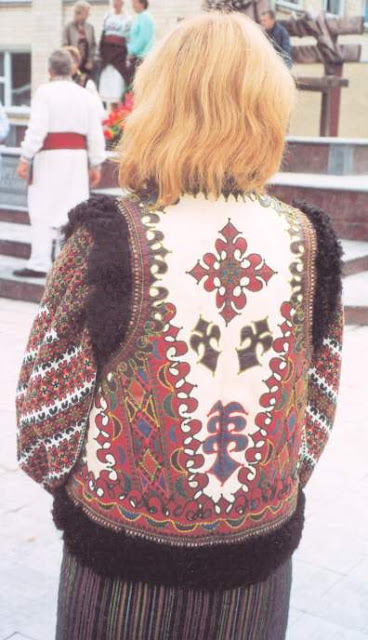 They are wearing 'fake' kyptary made of artificial fleece and vinyl, but decorated in the traditional manner. 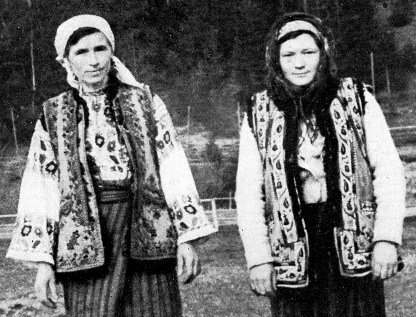 They are from the town of Zhabie, which is now known as Verkhovyna. 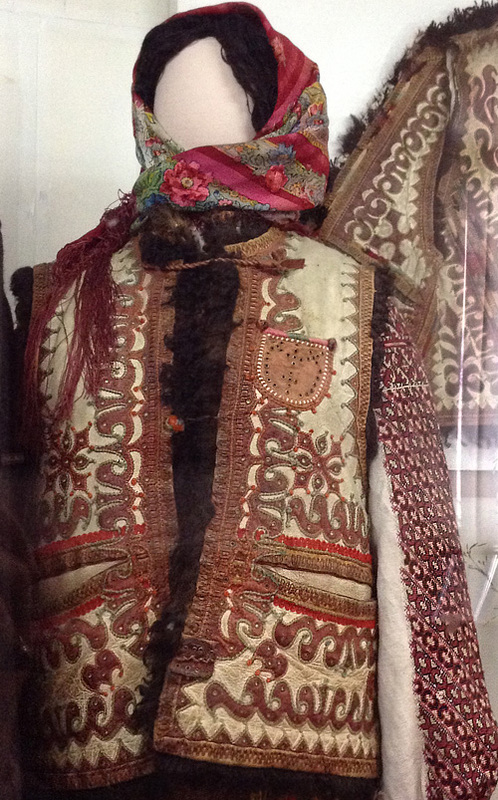 The sylianky have reappeared here, being placed over the seams and in the front panel. The front panel also includes a rectangle of rows of braidstich embroidery, in various colors. 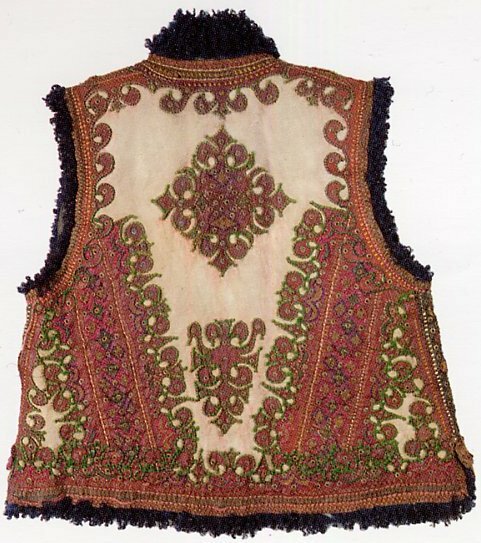 There is a similar panel on the back, along the bottom edge, and sometimes another one further up. 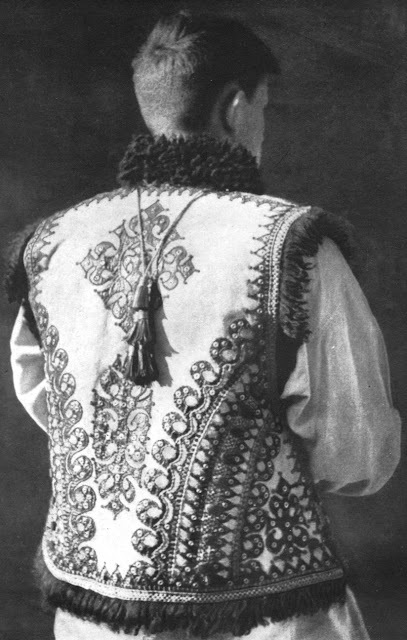 The teeth on the edge of the front panel are straight and triangular, and echoed along all the edges of the garment, and the pocket. The 'rachky', the crawdads have disappeared. 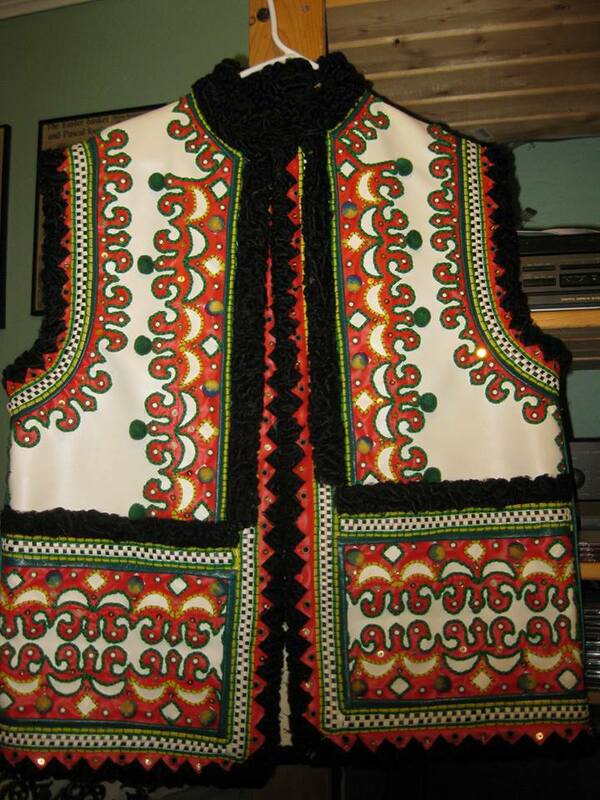 The curly lambswool around the edges is again in evidence, and all the appliqued areas are edged with wool cord. the small pompoms are still with us as well. Older examples are more restrained, but newer ones are sometimes over the top. This is from the town of Verkhovyna. 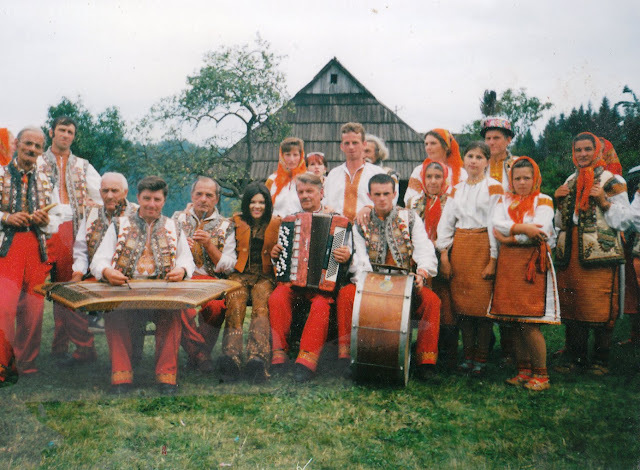 This one is from the village of Richka in Kosiw district. 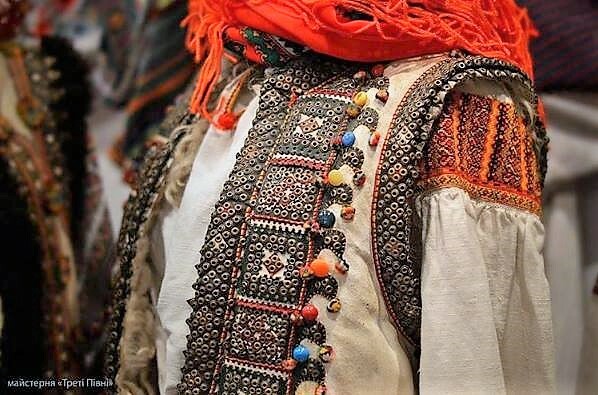 This one is from the village of Javoriw in Kosiw district. 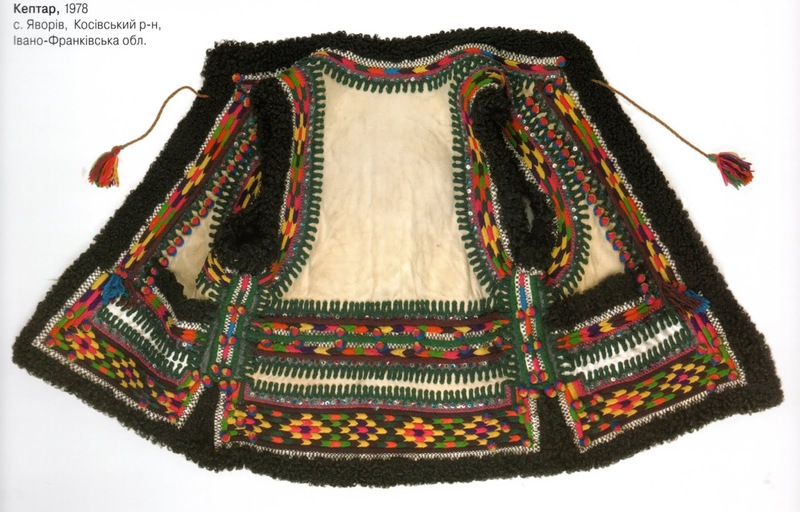 The following photos show the style of kyptar found in the southwest part of the Hutsul region, in the district of Rakhiw in the Transcarpathian oblast. This is typically cut somewhat shorter than usual. 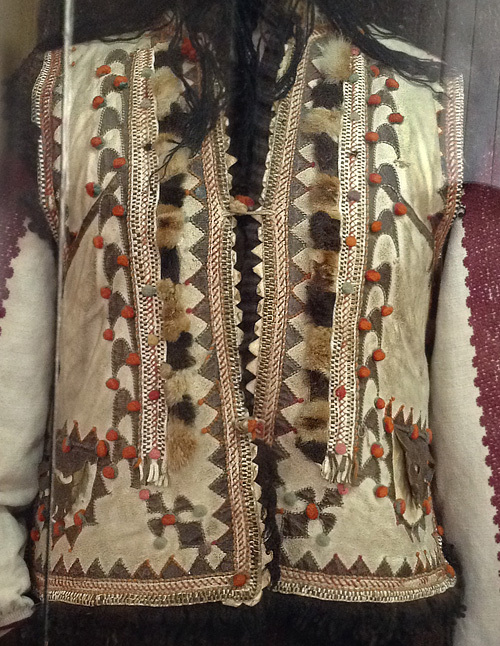 The sylianky appear around the armholes and collar, and form part of the front panel. 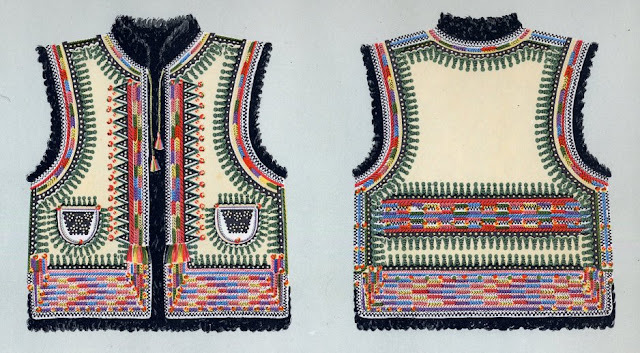 There are rows of braided stitch between them in the front panel. The teeth on the edge of the front panel are larger and fewer, curved and have more elaborate embroidery along their edges. 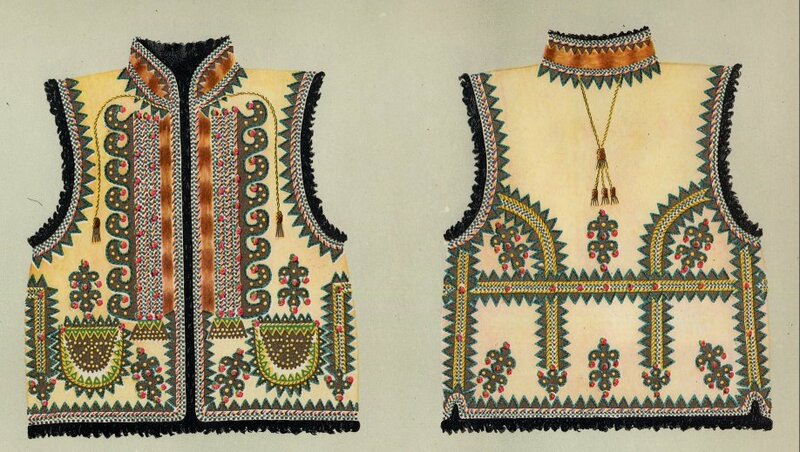 This embroidery is echoed along the inner edges of the armholes and the bottom edge. The pompoms are still here. 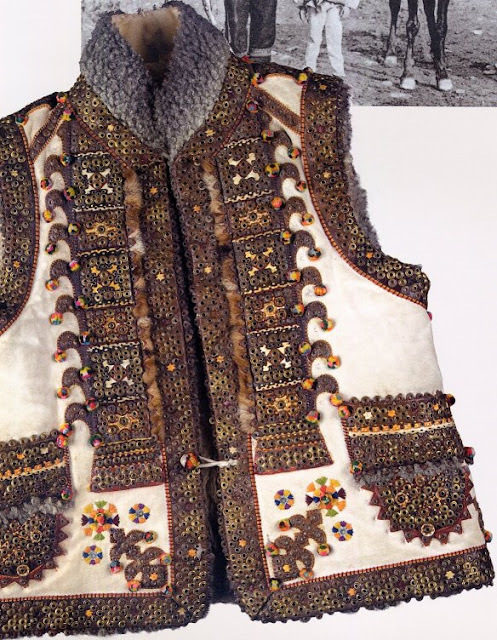 The lambskin has disappeared, its place being taken on the bottom edge and armholes by moroccan leather applique, and on the front and collar by patchwork made of fur. 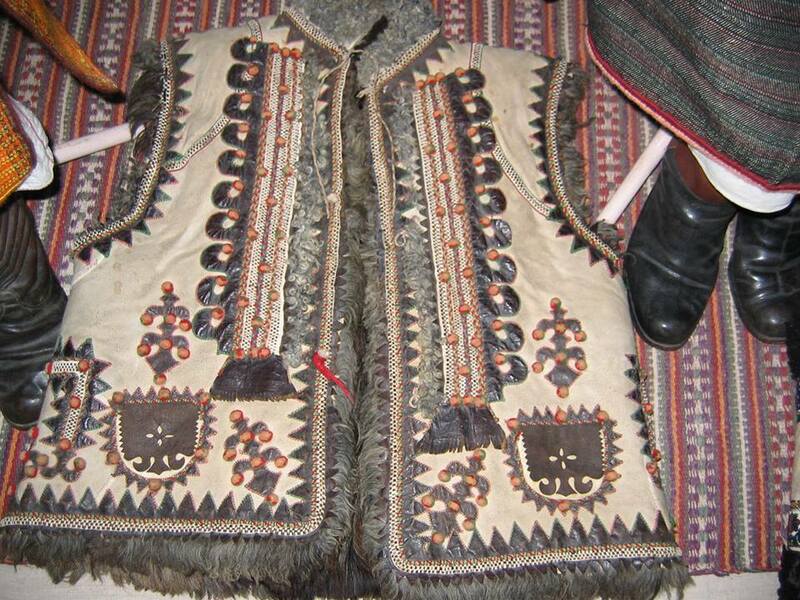 Tassels have appeared, on the front panel, and on decorative cords which hang down the back. 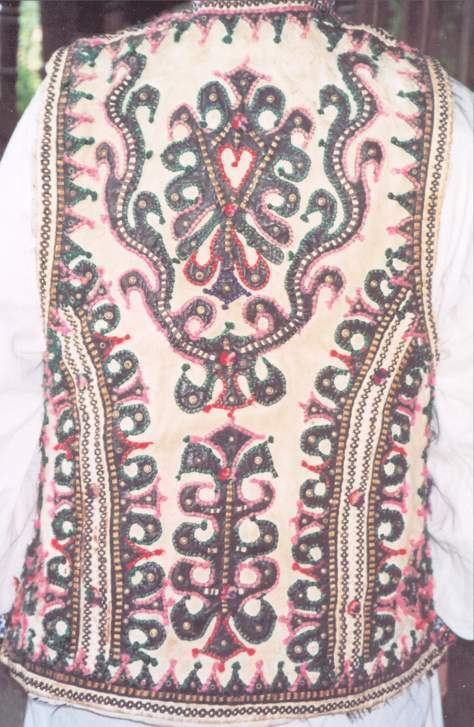 There are embroidered floral motifs which appear on the front lower corners, which may also be echoed on the lower back as in the bottom garment shown here. 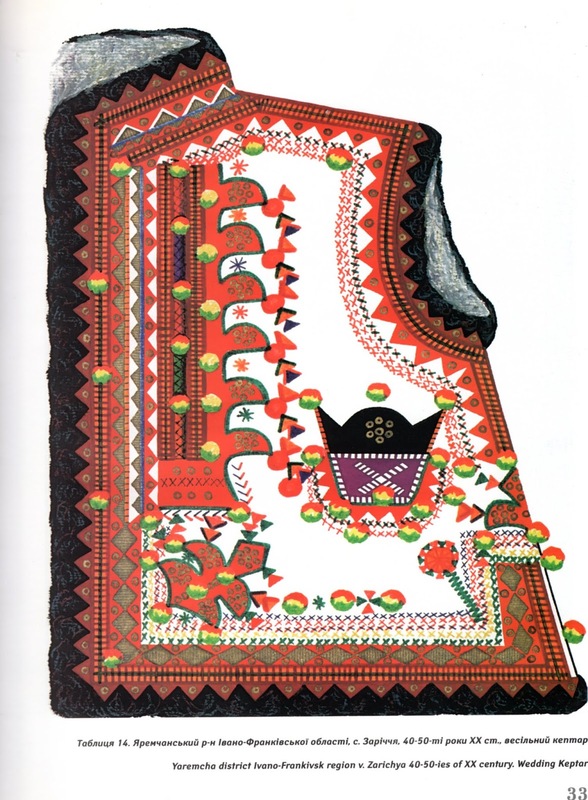 This example is from the village of Bohdan in Rakhiw district. The kyptar in the following two images are from the village of Kosiws'ka Poliana in Rakhiw district. 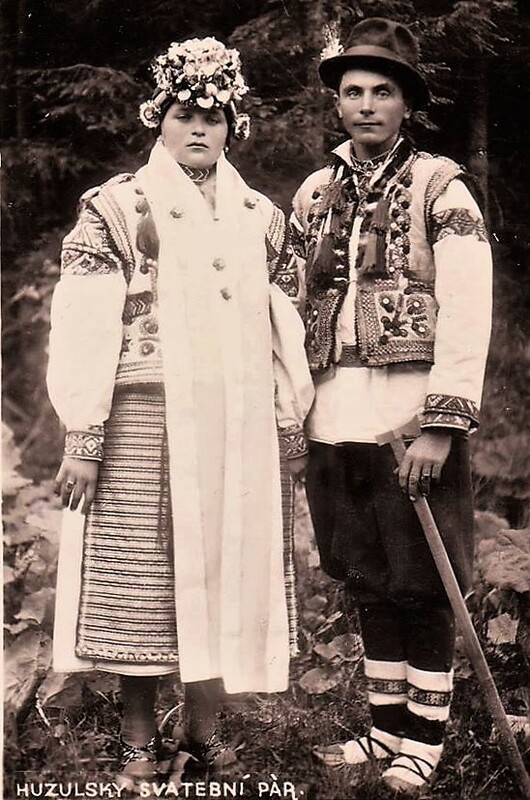 This type is found in the valley of the White Cheremosh river, from the twin villages of Roztoky, one on each side of the river in Kosiw and Putyla districts, south on both sides of the river into Verkhovyna district, as well as the tributary valleys. The teeth and sometimes the sylianky reappear. There are sometimes two extra seams sewn into the lower back, forming a princess line. These flare towards the bottom. This seam is ornamented with sylianky and moroccan leather applique. 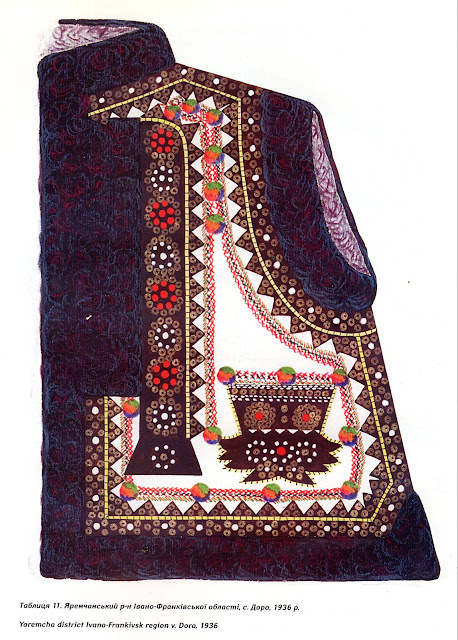 The red moroccan leather [sapianka] is the major design element, forming various sorts of florar motifs on both the front and the back. This applique is always edged with wool cording, and enhanced with metal eyelets as well. You can see various permutations in the three photos below. The following two images are from the village of Roztoky on the Bukovynian side. This example is from the village of Holovy, southeastern part of Verkhovyna district near Bukovynian Hutsulshchyna. 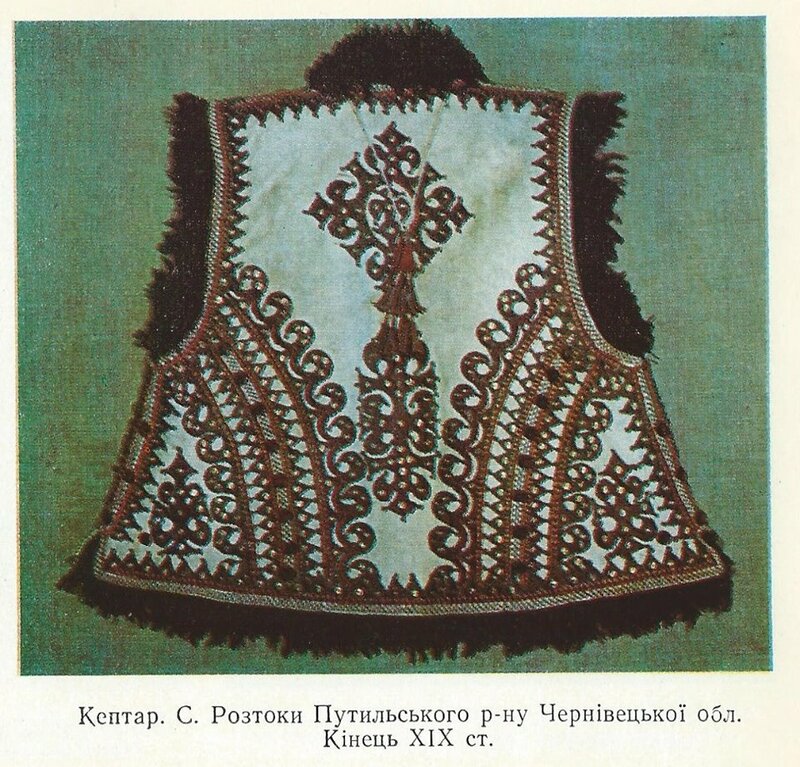 This Kyptar is from Ust'- Putyla in Putyla district, Bukovynian Hutsulshchyna. 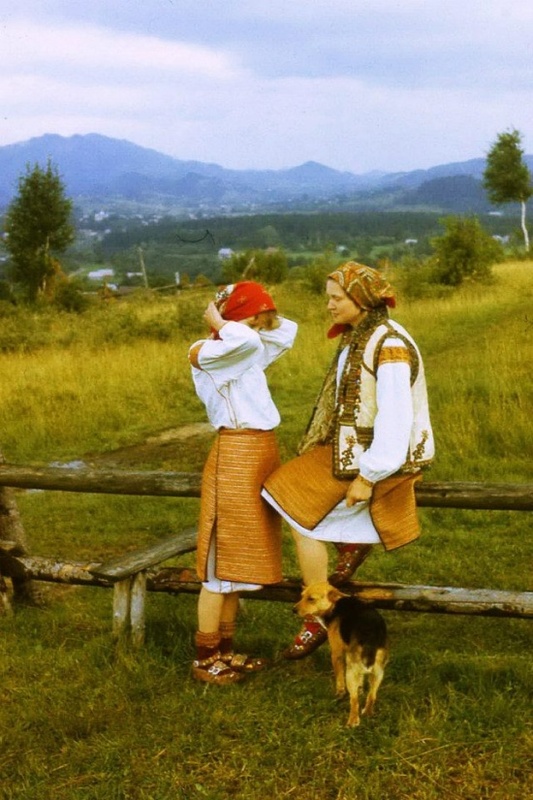 This example is from Roztoky, in Verhovyna district on the border with Bukovynian Hutsulshchyna. 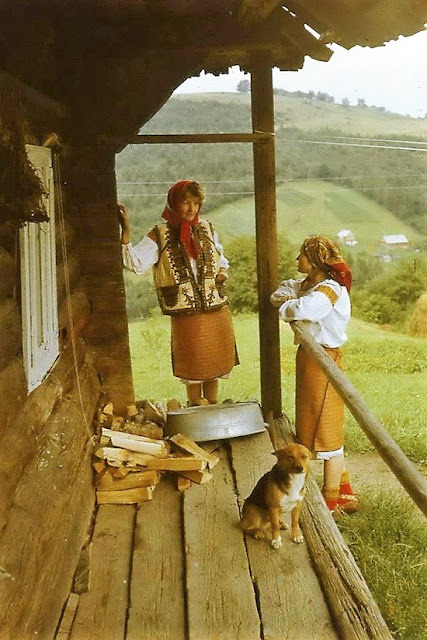 This one is from the village of Roztoky on the Bukovynian side. 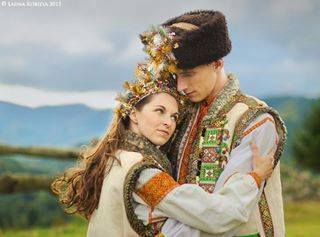 This one is from the village of Hryniava in Verkhovyna district. This piece is from the village of Dowhopillia in Cherniwtsi Oblast. This type is found in the foothills of the southeast edge of the Hutsul region in Chernivets' oblast, as well as among the Hutsul population of Romania. 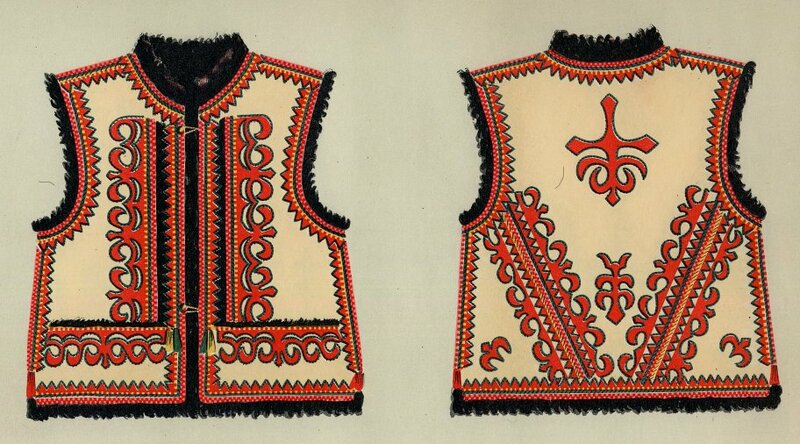 These two black and white photos were taken in Romania, the colored drawings below are of a garment from Chernivets' oblast. This type is cut longer than most and flares towards the bottom. 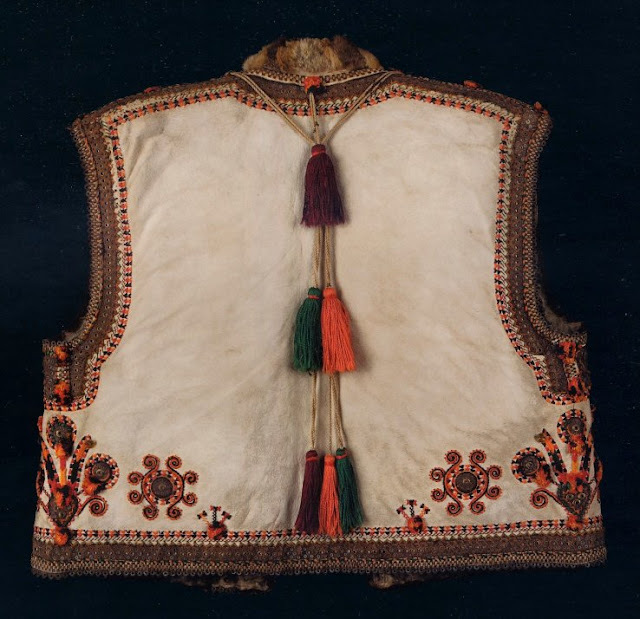 There is some moroccan leather applique on the front panel, and sylianky, moroccan leather applique and lambskin fleece around the edges. 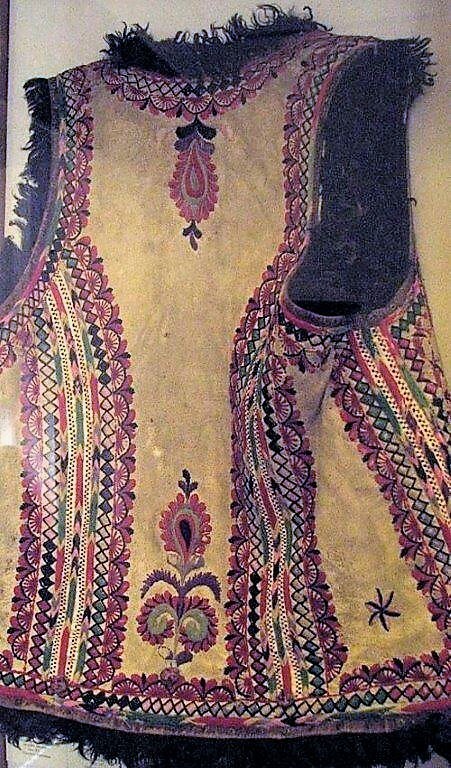 but the majority of the ornament takes the form of embroidery in cursive floral motifs executed in polychrome satin stitch. 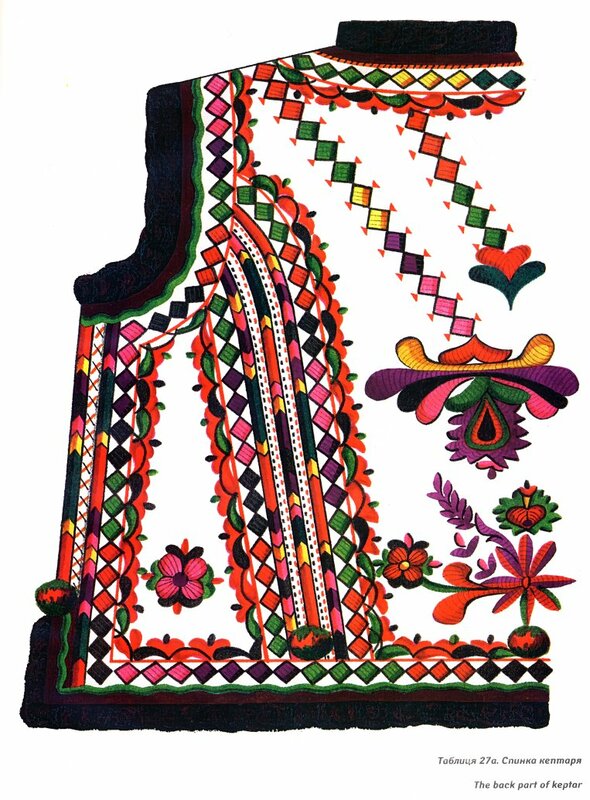 This style of embroidery is closer to that of the Hungarians and Romanians in Transylvania than it is to most other types of Hutsul embroidery, and adds yet another dimension to the palette of ornament of the Ukrainian People. This kyptar is from the village of Putyla in Bukovynian Hutsul territory. 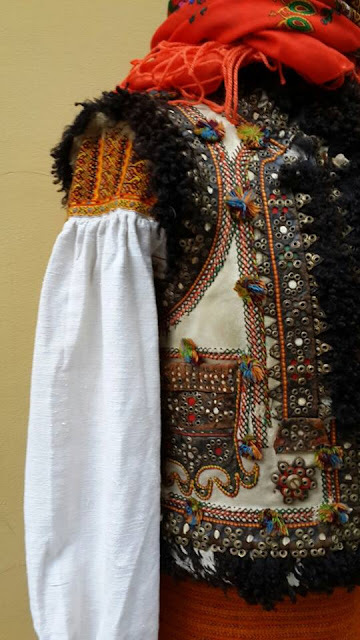 Here is a museum piece from this region. As always, i am open to ideas for postings, willing to do research on areas or garments that might interest you, and i take commisions to make new garments or embroider other pieces. 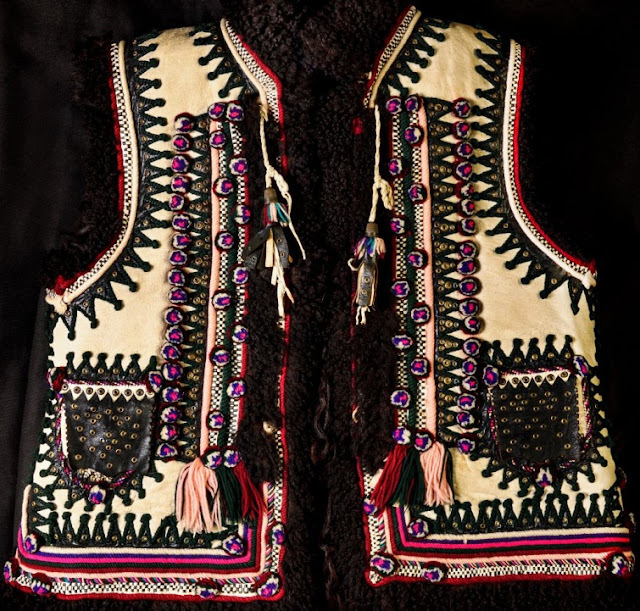 Thank you for including Eudokia and Dmytro Sorochaniuk photograph in you article.They have maintained the Hutsul textiles by not only through her embroidery, but also her loom work/weaving and keptar creations, but also his ability to build whatever was necessary for her to do her work. 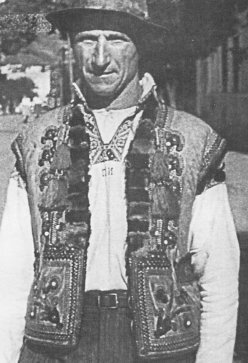 Mr. Dmytro was also the choreographer of the Cheremosh Dance Ensemble and a violin player and taught many to play the tsymbaly. You article is very interesting and informative. Thanks for the post. 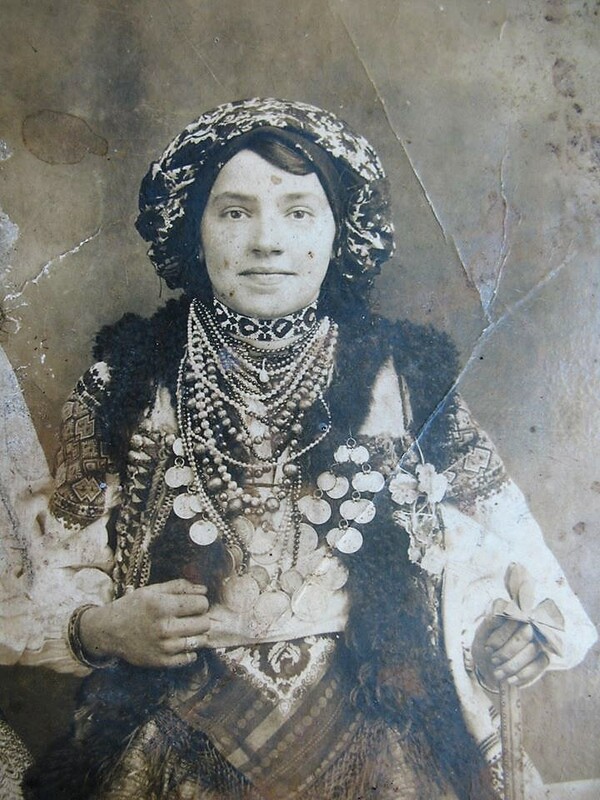 HI i am interesting in finding out more about Eudokia and Dmytro Sorochaniuk ( as part of a geneology search) do you have an e mail address i could contact you on?